Barracuda Carry-On Review | Nerd Much? When it comes to luggage, it’s not often that we would deem it “cool”. We used to think that when it came to carry-ons and baggage, there wasn’t much of an opportunity to have that wow factor — a bag is a bag is a bag, meaning they’re all basically the same. But every once in awhile, a seemingly dull category is jolted to life with a new innovative product, and that’s exactly what’s happened in the luggage category late last year, thanks to the Barracuda Carry-On. The Barracuda Carry-On flips standard luggage design on its head and injects quite a few new ideas. First, and most immediately noticeable, is its collapsible design, which allows you to store it neatly under a bed or hang it in a small closet without taking up too much space — it even comes with its own closet hanger. Secondly, we’ll have to commend the wheels on this thing — two big 2.75″ rubber wheels that could easily traverse over most surfaces. That might not sound like an important feature to most, but anyone who has ever been stuck with a wheelless bag or a bag that has crappy wheels knows how frustrating it is. But that’s not an intended selling point of the Barracuda Carry-On. What IS another selling point is the built-in laptop tray that some will find incredibly useful. It folds out of the lower part of the handle, and is contained in a zipper compartment for storage. Not only can it hold cups while you’re sitting in an airport or at a train station, but it can also hold lightweight laptops, tablets, and whatever else you might need it to hold. It also has lockable zippers that are unlocked only with the proper code, allowing you to keep your things safe. The Barracuda Carry-On also comes with a 10,000mAh removable USB battery pack that will allow you to charge your devices on the go. It slides into a pocket on the back of the case for recharging, and it’s easily accessible while on-the-go. Also inside the case, you’ll find a few bags, one for your dirty laundry and two for dirty shoes (one for each shoe). It’s not exactly a selling point, but it’s a cool little tidbit for Barracuda to include. 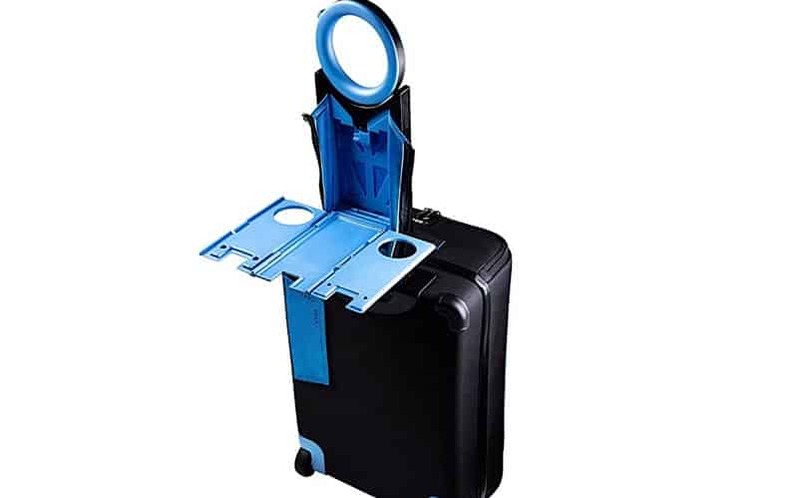 Aside from its collapsible design, its biggest plus is the fact that it has a huge handle that can be rotated to whatever position you’d like to pull your luggage along with. All too often, suitcase manufacturers have just a standard handle that puts your wrist and hand in an awkward position when you’re trying to lug it around the airport or a few blocks to your hotel. 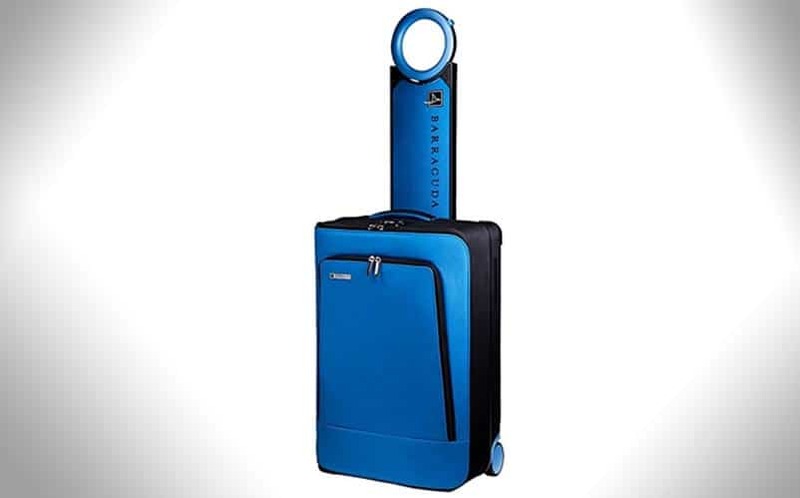 The Barracuda Carry-On, however, has a ring that rotates easily, making pulling it along much easier. Despite its hefty price tag, the Barracuda Collapsible Carry-On is a solid option when buying new luggage, thanks to its useful features that the frequent traveler will love. With the adjustable handle, included charger, and stowaway design, you won’t find a smarter luggage option on the market. While we’re a bit LTTP with the Barracuda Carry-On, I should probably note that we didn’t know about it until after we saw the new Kickstarter for Barracuda’s newest product, the Konzu, which they’re calling the world’s most advanced backpack. The Konzu comes with a charging station built right in, lock zippers, RFID blocking pockets, an open bag alerter, and it charges wirelessly using a special stand. To learn more, check out the official Kickstarter, which has already reached well over its initial $50,000 goal. But for now, if you’re looking for some smarter luggage than what you’d normally find, you can check out the Barracuda Carry-On on their official site. For more cool stuff to buy, stay tuned to Nerdmuch.com. You can also follow us on Twitter for timely updates.